Waterfront cottage on Sand Pond in the beautiful western Maine mountains, rustic but newly modernized, fully furnished kitchen, towels and linens provided. Cozy and welcoming. One step up to cottage, bathroom and master bedroom on first floor, gentle slope and a few stairs to lakefront and dock make it feasible for elder guests or those with limited mobility. It is small (756 square feet) but sleeps 3-6 adults comfortably. Cathedral ceiling and new Hunter ceiling fan in living room make it feel spacious and airy. Screened in porch and downstairs bedroom have ceiling fans; 2 upstairs bedrooms and each has a floor fan and cross-ventilation. This is a quiet (except during snowmobile season) winterized camp with a shallow (average depth 13 feet, 23 feet at its deepest point), warm, sandy pond, 40' dock with octagon, across a dead-end dirt road (and snowmobile trail, fun for mountain biking and hiking), so it may not be suitable for toddlers as other camps' residents do use the road. State certified as a Lake Smart house in August 2009, use of eco-friendly products required. Generator installed 2012. The firepit and charcoal grill are right on the water, across the dirt road from the cottage. Gas grill added May 2017. BOATING AND FISHING: the pond is known to be full of large-mouth bass and white and yellow perch, and loons serenade each summer evening. 2-person canoe, 4-person pedal boat, 2 new kayaks, 7 life vests provided. No large motorboats are present on the pond, but guests are welcome to bring a kayak, rowboat, or canoe. 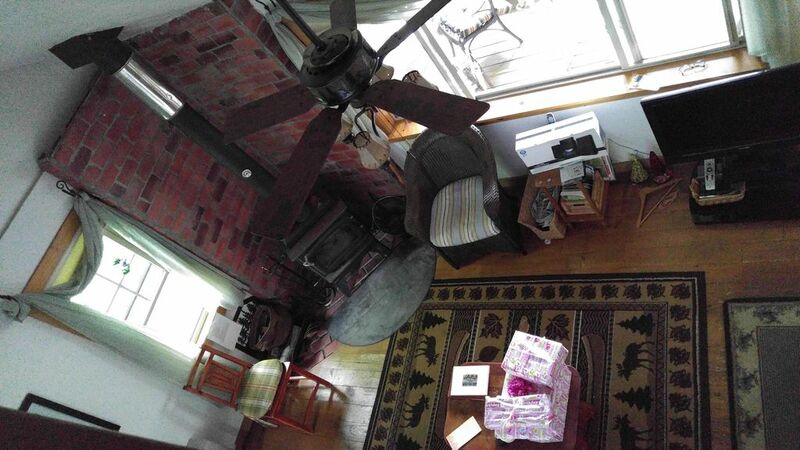 This is a very rural area, not for those who want constant entertainment, but great for reading on the front porch (completely screened in during April 2009, only first two photos reflect this) overlooking the pond or on the large octagonal dock or sitting in front of the wood stove. There is also a propane heater for the colder months (year-round, insulated cottage). Air conditioner available for living room, used once in 2013, breezes from the pond usually keep it comfortable. Fire pit and picnic table at the water's edge. Most popular activities: listening for the loons, sunset watching, swimming, boating, and hiking, berry picking, chilling in a porch rocking chair, lobster grilling, gathering with friends around the fire pit after sunset, board games. Land line phone in cottage. Cell phone reception is good on the porch, at least for Verizon and Maine Cellular subscribers: iffy reception for ATT, TMobile, Sprint. HDTV Satellite/high speed internet/WiFi; tv reception cannot be guaranteed during cloudy weather. You can quickly find small town life 10 miles away in Farmington and at the University of Maine, shopping, a movie theatre and bowling alley for rainy days. summer concerts and summer theatre nearby, a couple of interesting restaurants, two independent bookstores, an ice cream stand, antique stores in nearby towns, and a summer farmer's market. 15 minutes to pick strawberries and blueberries in season and buy freshly caught lobster. Half an hour to Mt. Blue State Park, 45 minutes north to scenic Rangeley with brilliant fall foliage and dramatic mountain views (and you may see moose), skiing locally at Titcomb Mountain and it's equidistant from Saddleback, Sugarloaf, and Sunday River. Sand Pond is about 3 1/2 hours from Boston and 90-+20 minutes from the coast. I'm a university administrator in New York City but need peace and quiet to balance that life. My great-grandfather bought a lakefront cottage in western Maine in the 1880s and I spent part of every summer of my childhood falling in love with this part of Maine and learning why generations of my family, mostly born in Jersey City, kept coming back to this very special place. Of course I brought my daughter here as a child to make sure she fell in love with it too! Sand Pond is 10 miles from a university town with some intellectual life, two good bookstores, a few good places to eat including a memorable ice-cream stand, a fresh-from-the-ocean lobster store, shopping for all the essentials, but not a mall in sight. It's too small for big noisy boats. There are only 30-odd camps on the pond and a similar number on Locke Pond right behind it off the same private road. I like the curvy country roads (in summer anyway), the warm shallow pond for swimming, the fact that I can't see or hear a neighbor but know several friendly folks are a phone call or a 2-minute drive away. Compared to the last rental I took before buying, where a neighboring camp sounded like a remake of Animal House every weekend, this place is pristine and quiet. Loons serenade their partners every night. I like being able to build a fire in the wood stove, cook for my friends, sit on the porch with a glass of wine and a book, or on the dock with one hand in the pond. You can boat around the pond and never see another human, or wave to children on a floating dock. Most of these cottages have not been gentrified or razed and replaced by McMansions, so it feels like a step back to a saner time and simpler pleasures--board games, jigsaw puzzles provided. If this scene makes you smile like it does me, you'll enjoy a stay here. on a private dirt road in the woods, with no other houses nearby, 10 miles from town. Cottage faces 81-acre pond in a private cove and has its own dock. Cottage is perhaps 30 feet from lake, across the private dirt road, great direct view from porch. 5 cement steps down to the dock. Firepit, picnic table, charcoal grill, hammock. new 9000 BTU air conditioner installed in the living room in late July 2013, will be installed upon guest's request, haven't needed it since. Breeze off the pond does the job! primary heat is woodstove; backup is propane. Beds will be made up with fresh sheets before you arrive. Plenty of towels and beach towels are provided, as well as kitchen towels, tablecloths, napkins. NOT fast enough for downloading large amounts of data, as many who work at home need to do. Fast enough for email and online searches. Wireless router allows you to use your laptop anywhere in the cottage, on the porch, probably on the dock! HP printer also supplied. For experienced users only; stove-cut wood supplied. New July 2012; note that a 24', 10 cubic foot is the biggest available for the space. owner leaves some spices, but no temptations for critters--this is the woods! oval table (seats 6) and 4 chairs in kitchen, round cast aluminum table on porch and 4 chairs, picnic table in front yard overlooking the pond. DirectTV satellite installed May 2009. Basic channels only (no HBO, SHO) Reception not guaranteed on cloudy nights, sorry! small wildflower garden established 2016; small number of raspberry, blueberry, and blackberry bushes at the end of the driveway. Front porch runs across front of cottage, screened in, table and four chairs, ceiling fan, reading lights, rocking chairs, overlooks pond. Floating dock in water deep enough to dive, added June 2013, in addition to existing 40' dock with octagon. 40' seasonal dock with octagon, 7 life vests. Guests are welcome to bring kayaks, bicycles. New cedar picnic table in 2011. Firepit rebuilt in 2017. Hammock added July 2012! If you are going to fish you need a Maine license, available for 1-3-7-15 days or all season, online at www.state.me.us/ifw/licenses_permits/fishing.htm. Buy locally or via credit card online and print immediately. Great masseuse 10 miles away. Very relaxing, Love hearing the Loons. Enjoyed Kayaking, swimming hiking. Delighted to have this return guest find her second visit as restorative as her first. We have few loons on this pond, but they are very vocal. The new kayaks have been well received. So glad to know! The cabin was very peaceful and quiet. Just what we needed! Thank you! The cabin was clean and had everything we needed. I would highly recommend it to those who are looking to get away from the crowd. Appreciate your comments. You were a thoughtful, considerate, attentive guest. I chose this cottage a decade ago precisely for its peacefulness and quiet, and along with my local property manager and housecleaner, work hard to ensure every guest finds it clean, welcoming, and well equipped. Do come back! This is the second September that my husband and I have spent at Pinehurst Too on Sand Pond. We love it! The camp has everything we need, and even kayaks and a canoe. Our dogs love it too. There are very nice hiking trails just steps away, and of course they love the water. Hopefully we'll be back next year as well! There is no better endorsement of a vacation rental than a returning guest, and I am delighted that the attention I and my property manager and house cleaner pay to keeping Pinehurst Too immaculate and well outfitted makes for satisfied guests. It's a mutual effort--these are wonderful guests. Beautiful little cottage overlooking Sand Pond. Loved reading on the screen porch and dinner at the picnic table watching the loons. Thank you for a review that illustrates the quiet ambiance, the feeling of being in a peaceful, beautiful retreat. Exactly what guests choose Pinehurst Too for. My mother, my 11 year old son, and I spent a week at Pinehurst Too. What a wonderful vacation spot! The cottage is well appointed with every amenity you can imagine. Sand Pond has so much wild life in the area. We spent the day enjoying the loons, ducks. turtles, and even a deer. We are looking forward to returning to this cottage. Appreciate the gracious review. I do keep the cottage stocked with all the amenities I think guests will enjoy, based on the 17 years I rented before I bought. Even I have not seen a deer in this space! I will encourage this guest to reserve early for her return visit; I've disappointed several people this year, including guests who wanted to return, but inquired too late. Guest passes to U. Maine at Farmington's gym with exercise equipment are available for purchase. On snowmobile trail ITS 82 and in the summer we see an occasional ATV. While you cannot see a neighboring camp, noise is amplified over water, so if someone nearby puts 20 people around their fire pit and has a party, you are going to hear it. This does not happen often, it's not a frat party area, mostly owner occupied, but absolute quiet cannot be guaranteed. Also, this is not the last camp on this dead-end road: 7 neighbors farther down the road do use it, so cars, trucks, ATVs, bicycles, people walking or running with their dogs do come right in front of the cottage. Check in is 3pm; check out is 11am. In case of cancellation, deposit will be returned only if the property is re-rented for the period you reserved. The full week's rent is charged for partial weeks. Maine lodging tax increased to 9% on Jan 1 2016. Partial weeks/long weekends considered except in July and August. Nights after first two @$175 each are reduced. Ask for details.